Found this in a news article about China's (alleged) new rail gun. 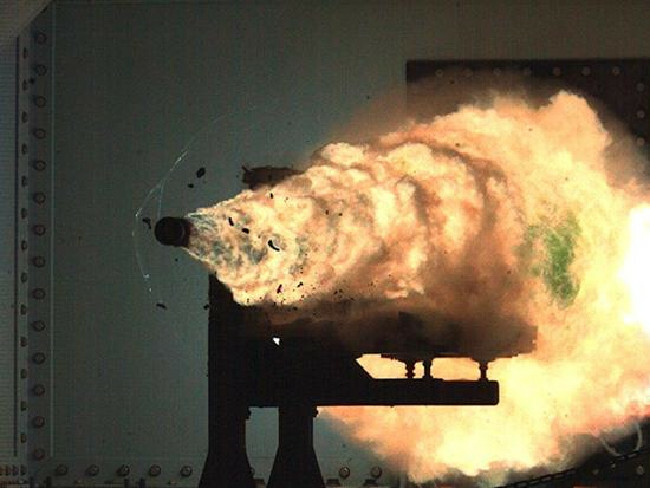 This is supposed to be a test firing "of a US navy electromagnetic rail gun that can fire projectiles at 8700km/h — without the aid of gunpowder"
If the cannon doesn't use any gunpowder, and the projectile is not self-propelled, where is all that fire coming from? My first thought was this must be an ordinary cannon firing an ordinary projectile from an explosive propellant and no one bothered to do any research before publishing the article, as is standard procedure for modern news. Then again, despite the aerodynamic design of the projectile it must create some friction against the air and the barrel, and in turn heat; the magnetic propulsion system may also generate heat on the projectile through induction. Would a projectile fired from a suffiently powerful railgun create such an explosion when exiting the barrel? Hypersonic projectile tend to ignite the air around them. Consider a meteor entering the earth's atmosphere. Ok, so it does generate sufficent friction. My mental picture of railgun operation had left out that aspect of physics.